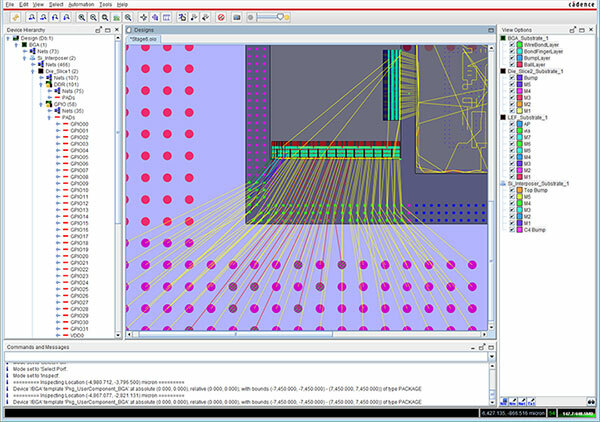 Cadence® OrbitIO™ Interconnect Designer helps your design team quickly assess and plan connectivity between the die and package in context of the full system—all within a single-canvas multi-fabric environment. It’s ideal for system architects or anyone responsible for developing the die-to-package interface and coming up with the optimal combination of bump/ball configurations and net assignments. OrbitIO Interconnect Designer helps semiconductor companies evaluate route feasibility of the package, as well as develop and communicate a route plan to their package design resources. Unlike an iterative spreadsheet-based approach, OrbitIO Interconnect Designer lets you make or refine decisions, then immediately visualize and evaluate the impact on adjacent fabrics, all within a single tool. In doing so, it significantly reduces iterations between your silicon and package design teams as they try to converge on a solution. OrbitIO interconnect designer helps you better qualify the design definition prior to implementation, leading to more predictable system cost, performance, and product delivery.